It's no secret we'll be at E3, but why would we keep a secret like that anyway? How about that Injustice, huh? 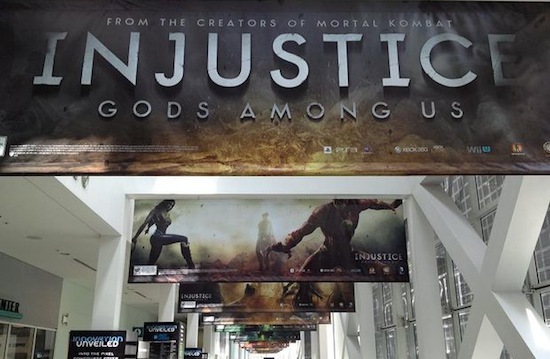 Destructoid got an early look in and out of the LA Convention Center and found that Injustice is very much on display at full force with banners all over the hallways. Also tomorrow at 11:30am Pacific, Ed Boon stops by GameTrailers to kick off their E3 All Access Live show coverage with new footage from Injustice. This should be viewable online at GameTrailers.com which is said to be mobile friendly this year as well so you can watch from your cell phones or tablets. We're guessing we will see the game make an appearance at one or all of of the big three pre-E3 Press Conferences. Then, later in the show we hope to catch up with NetherRealm Studios to get a look and hopefully get our hands on Injustice. So I want to share with you the schedule I have and how you can watch with me, Live! All times listed are Pacific (local to the event). E3 Show floor opens up at 12:00pm on Tuesday. So what if you're looking for non-TRMK related news? Want to know something more than just Console, Injustice or NetherRealm Studios info? Then go to SavingContent.com where we'll the latest of what I see and do. Give the Twitter a follow for updated news as well. Do you have a question about Injustice you want us to get answered in our developer interview(s)? Be sure to leave them in the comments here, and we'll try to get the best questions answered! 1) Are there stages without the usable objects? Is there an option to remove them? 2) Does it use the same dial-a-combo system as MK9? 3) Info on the button configuration would be nice. I didn't ask questions about the extra features on the Wii-U's port and the guest characters, 'cause we all know that they are not allowed to reveal such things yet. Yeah ask about button configurations. I wanna know if I can use my mk fightstick with this game please. Can you use more than one attack whilst you're jumping? Can you ask the following 3 questions for me? : 1) Ed mentioned blood in Injustice the live stream. I HIGHLY doubt we'll see fatalities. Will we at least see X-Ray moves in injustice? 2) Have they fixed the online netcode or going with another online server company other than GameSpy? 3) How many characters can we expect (roughly) on the roster, once the game is completed? 1) How many SUPERMOVES per character? More than 1? 2) When you finish a character with a SUPERMOVE, does it look any different than midgame (like orange flashes in SF 4)? Can you combo into environmental moves?